Elderly Muslims are being advised not to take part in the annual pilgrimage to Mecca because of a deadly new Sars-like virus. Pregnant women, children under 12 and people with chronic illnesses should also abstain from performing the Hajj later this year, health officials said. So far Mers-CoV, which stands for Middle East respiratory syndrome coronavirus, has killed half of the people known to be infected. The World Health Organisation (Who) said the disease is a ''threat to the entire world and emerging faster than our understanding''. Its latest data shows there have been 90 laboratory-confirmed cases, including 45 deaths. Three people have died in the UK as a result of the infection, including a 49-year-old Qatari man who died at the end of June. He was being treated in the intensive care unit at St Thomas' Hospital in central London but died after his condition deteriorated. 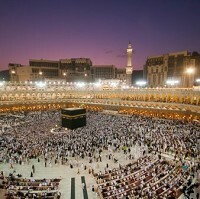 The Ministry of Health in Saudi Arabia said vulnerable groups should not participate in the Hajj this year "for their own safety". It also advised pilgrims who are attending the event to comply with public health guidance, including wearing masks in crowded places. Although vulnerable groups are urged against travelling to Mecca, the warning underpins the importance of seniors travel insurance for older people when travelling abroad in general, as well as medical travel insurance for those with ongoing conditions planning holidays to other destinations. The Hajj is the largest annual pilgrimage in the world, with all Muslims striving to undertake the sacred journey at least once in their lifetime. It is estimated that up to 25,000 British Muslims will make it this year, and those who do should ensure they take out travel insurance before leaving home. Health officials in the UK have been told to be vigilant for severe unexplained respiratory illness in anyone who has recently travelled to the Middle East, and also watch out for any unexplained clusters of such illness. Coronaviruses cause most common colds but can also cause Sars (severe acute respiratory syndrome), which led to the deaths of hundreds of people in Asia following an outbreak in 2003.